I’ve been working in Eastwood City for almost four years now. (No, I don’t work in a call center.) So I pretty much know the ins and outs of this micro commercial/business/residential district in Quezon City. Owned and managed by the Megaworld Corporation Eastwood City is located on 16 hectares of formerly industrial land between E. Rodriquez Jr. Ave (C-5) in Libis and the Marikina River. See the official website. Among the prominent companies based in Eastwood City are Citibank and IBM, both having their head offices in Eastwood and their own buildings with leasable office space. The northern perimeter of the area is ringed with lots of condominiums with the centerpiece One Central Park nearing completion and the luxury LeGrand starting its foundations. 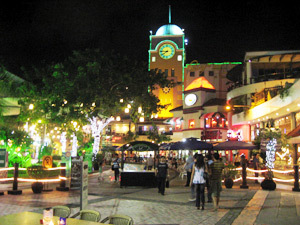 Eastwood City is also well known for its Citywalk and Citywalk 2 malls which feature many al fresco restaurants and cafes. Funnily, the first three floors of the Cyberplaza Building was called the Cybermall and was intended to be a high-end center of anything Information and Communication Technology, much like SM’s Cyberzone and Glorietta’s Techzone. Unfortunately, many cyber-stores have closed (like Villman, Globe Telecoms, and Smart) and has been replaced with fashion boutiques. Because of this, the Cybermall has been renamed as the Cyber & Fashion Mall. One interesting thing about Eastwood City with respect to Google Maps and other online mapping services with aerial/satellite imagery is that Eastwood provides a very decent way to estimate when a satellite image was taken. Eastwood City is in a state of constant development and there is practically a building finished there every half year. I’ve used this knowledge in my main blog to compare the satellite imagery offered by Google Maps and Yahoo! Maps. Google Maps has the newer imagery (from Digital Globe) at around September 2004 while Yahoo! provides imagery1 from late 2002 (care of GeoEye). 1 Microsoft also offers satellite imagery of Metro Manila only (for now) and it’s the same as Yahoo!‘s. Apparently, they both share the same image provider. is there a a shuttle in ampid or maly san mateo rizal that will enter the eastwood city? How far is the airport from Eastwood and how much should I pay taxi? Do you know Slight Edge Ent. in the Grand Palazzo Bldg.? What is it about? Thank you! hi. since you said that you know the ins and outs of eastwood city, do you happen to know any airline ticketing office in eastwood? thank you.